• Prevents sawdust filling up or clogging vacuum cleaners. • Provides huge 20Ltr capacity. • Easy to handle and empty. • Includes Hoses as pictured. 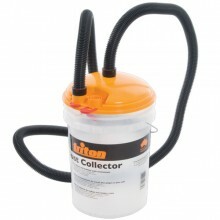 Click the button below to add the Triton Dust Collection Bucket 20Ltr #DCA300 to your wish list.